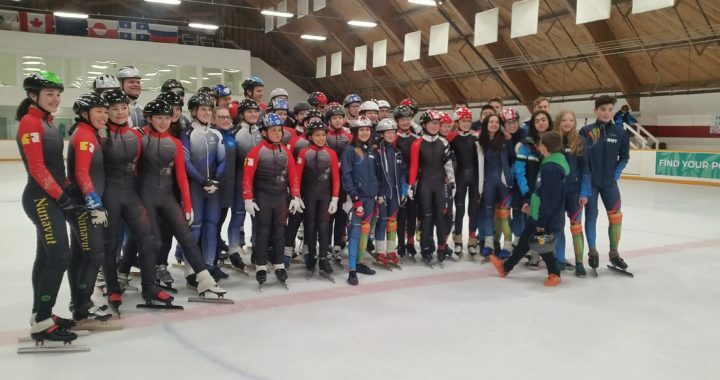 Team NT returns from the 2018 Arctic Winter Games with a haul of 20 ulus in short track speed skating, including four titles. Congratulations to our coaching staff and all our athletes! Braeden Picek, from the Inuvik club, won the 1000m and 1500m junior male gold ulus. Dalton McLeod, also from Inuvik, won the junior male 777m contest, and the junior male relay team also took gold. Luke Dizon, Daphne Cloutier, Dalton McLeod, and Grace Clark all won individual silver ulus, while there were second-place finishes for the junior female and juvenile male relay teams. Bronze ulus went to Kaleb Picek, Braeden Picek, Dalton McLeod, Seigna Hult-Griffin, Luke Dizon, and Daphne Cloutier, alongside the juvenile female relay team. NWT Speed Skating thanks all athletes, coaches, officials, and volunteers for their part in an enjoyable, friendly, and memorable week of racing. Thank you to the community of Fort Smith for your wonderful work as hosts – we are excited to bring more speed skating to the South Slave in the near future. To see photos from the Games, head to our Facebook page. Enjoy!